Every now and then I come across something in the back of a pantry shelf that I’d completely forgotten about. Current case in point: most of a package of imported Italian dried chickpeas. Since they clearly had seniority among my dried beans and pulses, I felt I should make a special effort to use them. A timely email newsletter I received from the heirloom bean company Rancho Gordo featured a recipe for a winter salad of garbanzo beans (Rancho G uses the hispanic name) and carrots. So I started by making that. I soaked my chickpeas overnight in cold water. Next day I tossed them in a small mince of carrot, onion, and celery sauteed in olive oil, covered them generously with water, simmered until they were tender, drained and let them cool. The remaining vegetables were raw: grated carrot, thinly sliced shallot, minced garlic, and chopped parsley. All were tossed together with olive oil, lemon juice, salt, pepper, and ground cumin. I cut back on the recipe’s carrot quantity. It wanted 5 or 6 large ones to a cup of cooked chickpeas, which seemed like much too much. It made a pretty dish, but it’s definitely one for lovers of the allium family: the amount of shallot and garlic were almost shocking at first taste. But the interplay of that sharpness with the sweetness of the carrot, the savoriness of the chickpeas, and the spiciness of the cumin grew on me. I wouldn’t want it often, but it was an interesting discovery. Next I tried a new-to-me chickpea soup. Soupe aux pois chiche is a Languedoc recipe in Anne Willan’s French Regional Cooking, a book I usually find very reliable. This dish was not a success. Several aspects of the instructions seemed peculiar. To start with, there was an odd initial treatment of the chickpeas. After an overnight soak, there was a one-hour simmer, uncovered, starting with fresh water; then another uncovered simmer, in yet more fresh water, for another hour or more, until the chickpeas were tender. Wouldn’t all that plain water leach out some of the peas’ flavor? Meanwhile I softened a sliced onion and a big sliced leek in olive oil, added a cut-up tomato, and cooked for a few more minutes. Then I was supposed to drain the chickpeas; return the water to the pot and bring it to a boil; add the sauteed vegetables and half the chickpeas; and cook until they could be crushed easily. The rest of the chickpeas were to be kept for another recipe. What was the point of that?! I just used half the amount of chickpeas to begin with. 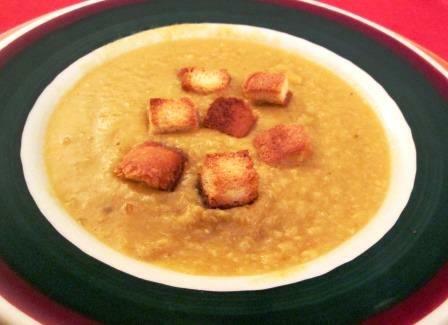 I pureed the soup, reheated it and served it with croutons, as directed. It was totally insipid. The chickpeas could have been excelsior, the other vegetables were undetectable, salt was desperately needed, and when it went in, salt was all you could taste. I expect to occasionally come upon recipes I don’t like, even from cooks I respect, but this one was truly dismal. 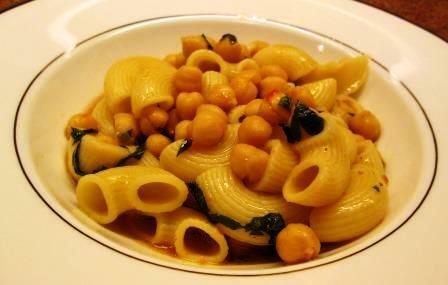 After that disappointment, I turned to a tried and true recipe for the rest of my chickpeas: pasta e ceci, from Tom’s and my second cookbook, The Seasons of the Italian Kitchen. The dish this simple recipe produces is the sort of thick soup or wet pasta on which generations of Italian peasants gratefully survived winter. Pure southern Italian soul food. After the chickpeas are initially reconstituted (the recipe uses the two-minute boil plus two-hour hot-water soak method rather than the overnight cold-water soak; either is fine), they’re drained, returned to the pot, and stewed with canned Italian plum tomatoes, olive oil, salt, and fresh water, absorbing flavor as they go. Needing only an occasional stir, the chickpeas simmer along gently until tender. Since that can be anywhere from two or four hours, depending on their freshness, it’s good to do this in advance. The pot can sit on the back of the stove until dinner time approaches. Then you bring it to a boil, stir in short pasta, such as shells or ditalini, and cook for about 20 minutes, until the pasta is done. Add an aromatic mince of garlic, basil, and parsley, some olive oil, and lots of freshly ground black pepper, and serve. Ambrosia! After some years in the middle east I wondered at the high incidence of gout in people who do not drink. 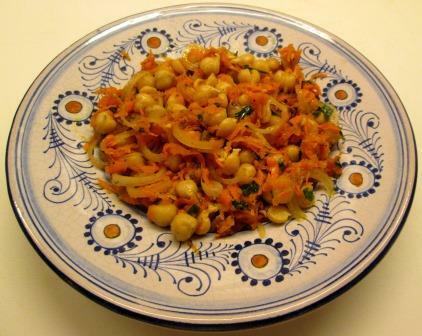 The catalyst turned out to be chickpeas which they use in abundance. I”ll go with the pasta e ceci. When I was a child, we lived for awhile amongst a large Italian family with a field of chickpeas. I still remember the wonderful taste of fresh chickpeas out of hand, snitched during the harvest. Gee, I’ve never even seen chickpeas growing on the — vines? bushes? I don’t even know that. Wish I could have tasted them raw as you did. Who’d care that, as my previous commenter pointed out, they’re so heavy in purines! Low-growing bushes. Yes. You just have to cut back on the foie gras. I cook them in the Pressure Cooker:always tender and creamy.